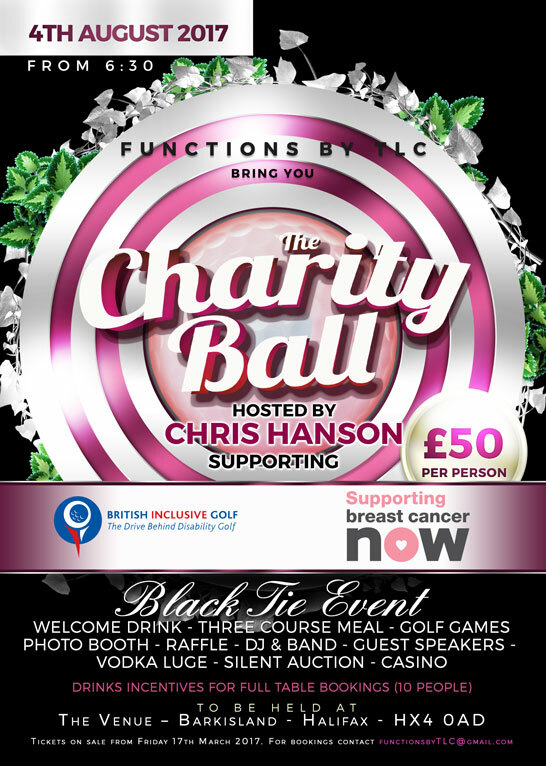 I am excited to announce that I will be hosting a Charity Ball in aid of Breast Cancer Now, the UK’s largest breast cancer charity dedicated to funding research into this devastating disease, and British Inclusive Golf (BIG) who aim to bring disabled and non-disabled people together on the golf course through a variety of initiatives. Supported by my wife Laura, my caddy Steve Tooby and his wife Tracey, we will hosting the Charity Ball at The Venue, Barkisland on Friday 4 August 2017 from 6.30pm and are hoping to raise over £15,000 towards Breast Cancer Now’s lifesaving research, and to support the drive of BIG to allow golf to continue to be a sport for all. It promises to be a fun night including pre-dinner drinks, a three course meal, entertainment and guest speakers, amongst many other fundraising activities including an indoor golf practical competition, a casino, and a photo booth where we are hoping to raise lots of money for Breast Cancer Now’s vital research to stop women dying of breast cancer, a cause very close to my heart as thankfully both my own mother, Sue, and mother-in-law, Linda, beat the disease. Unfortunately, my godmother, Sue Horsfall, recently lost her battle to the disease so we are very keen to make this as successful as we can in her memory. As an ambassador for the national charity British Inclusive Golf, we aim not only to raise some much needed funds for the fantastic work they do but also help raise awareness of this dedicated charity. Tickets for the event will go on sale from Friday 17 March on a first come first served basis, priced at £50pp. Full table bookings of 10 people are priced at £500 but will be treated to an exclusive drinks package. For more information on the event, our limited number of sponsorship packages or to book tickets, please contact FunctionsbyTLC@gmail.com from 17 March 2017.